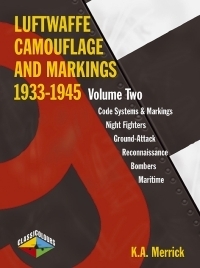 Advantages: Excellent description of pre-war and wartime Luftwaffe code systems and markings; description of application of paints and camouflage patterns; good coverage of Luftwaffe night fighter, bomber, gound attack, reconnaissance, maritime, transport and trainer camouflage and markings; discussion and conclusions are strongly supported by official documentation wherever practical; carefully selected photos (including many in colour) with helpful captions; actual paint samples supplied on separate cardboard charts; numerous new and interesting interpretations of a number of finishes. Ken Merrick is one of the world's foremost researchers on the subject of Luftwaffe camouflage and markings. His 1980 title, "The Official Luftwaffe Guide to Painting German Aircraft", co-written with Thomas Hitchcock, remains a favorite reference source for modellers and Luftwaffe aficionados, regularly commanding hundreds of dollars when a copy appears for auction on Ebay. It is therefore no exaggeration to state that Mr Merrick's latest series, "Luftwaffe Camouflage and Markings 1933-1945", has been long awaited and eagerly anticipated. Volume 2 commences with an excellent description of Luftwaffe code systems, unit markings, tactical and special purpose markings. This subject is thoroughly and logically covered in four chapters over 72 pages. This complex and fluid subject has rarely been tackled in print before, and never as well as this. The detailed text is supported by illustrations, tables and captioned photographs, and many worked examples of the systems are offered. One of the rare and treasured titles in my bookshelf is Ken Merrick's 1977 work, "German Aircraft Markings 1939-1945". This has been my primary source on the subject of Luftwaffe codes and marking systems until now. The first four chapters of Mr Merrick's newest title supersede and significantly supplement the information in this older work. The remaining 145 pages cover camouflage schemes as applied to Luftwaffe night fighters, bombers, ground attack, reconnaissance, maritime, transport and trainer aircraft. Each aircraft category is treated to a chapter detailing different applications in various theatres, and the evolution of schemes for each type over time. The detailed text (thoroughly referenced against official sources) is well supported by captioned photos, many in colour. In addition to the official schemes and markings, there is also sufficient attention applied to the exceptions. Volume 2 is rounded out with a final chapter on the application of the Balkenkreuz and Hakenkreuz. In common with Volume 1, this title includes colour chips. This time, the chips are labelled and do not suffer from the technical problems experienced with the first issue (ie, they are not stuck together). A small booklet explaining German paint technologies from 1930 to 1945 is also included. If you already own Volume 1 of Ken Merrick's "Luftwaffe Camouflage and Markings 1933-1945", you will not need my recommendation. You will probably already have this concluding title on order or in your hot little hands. The two books together represent a detailed and serious examination of this complex subject. "Luftwaffe Camouflage and Markings 1933-1945, Volumes 1 and 2" will be an essential companion for serious Luftwaffe enthusiasts and modellers who are interested in the background and application of German aircraft paints in WWII.